A U.S. state located in the northwestern region of the country. Idaho is bordered by Oregon and Washington to the west, Utah and Nevada to the South, Montana and Wyoming to the east, and the Canadian province of British Columbia to the north. The Rocky Mountains and many large rivers, lakes, and falls make Idaho a scenic state with a diverse climate. Before the arrival of European settlers in the 19th century, the state was occupied by the Nez Percé, Coeur d'Alène, and Shoshone Native Americans, among others, and evidence of human presence in the area goes back at least 14,500 years. French-Canadian trappers and American explorers passed through the region, and non-indigenous permanent settlements and military posts were established in the second half of the 1800s, with fur trade and mining operations providing a basis for commerce and industry. When Idaho gained its statehood in 1890 its economy shifted toward agriculture and timber, as well as tourism. Idaho is known as the "Gem State," due to the variety of gemstones that are abundant in the area including garnet, opal, jade, and agate. It is also often referred to as the "Potato State" since potatoes are one of the state's most popular crops. 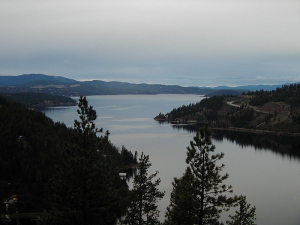 "Lake Coeur d'Alene in Idaho, August 6, 2006" by Jami Dwyer is licensed under CC BY-SA. 1956 Idaho in the Pacific Northwest. Caldwell: Caxton Printers. 1976 Idaho: A Bicentennial History. New York: Norton.